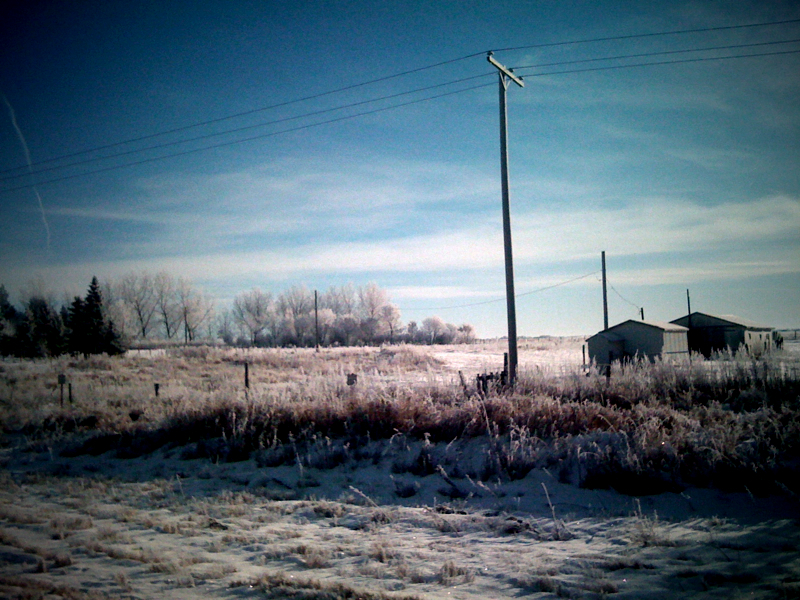 Here now mid-Saskatchewan, just outside of Regina, six hours from Winnipeg, on a beautiful sunny Monday morning. The CBC keeps us company as we pass other salt-encrusted vehicles, semi-trailers and giant specimens of modern farming equipment. In the back seat the intelligentsia are keeping us alert with questions stimulated by reading material picked up at the last gas station. The red-suited pa is due in this burg. Far back in a hay bin. The apartment of two psychiatrists. Stepping on the pad cover. Hmmmm, I can’t get “The apartment of two psychiatrists”. Still thinking on it though. The beautiful prairie shot is awesome! You must be in Winnipeg by now.. looking forward to a visit. And I hope Nicholas brought his “1st nations project”. Thanks for the carol quiz! It was tough but I finally got the “Nutcracker Suite” – didn;t think that was a carol though. Love the Sask photo – where exactly – I think I was there! Well done, Josie! It took me most of SK to get that one!